This afternoon I went to the petting zoo with Walt. Lot of fun. After that, I decided to do a test run of the Campeur for what it was made to do. Long loaded rides. 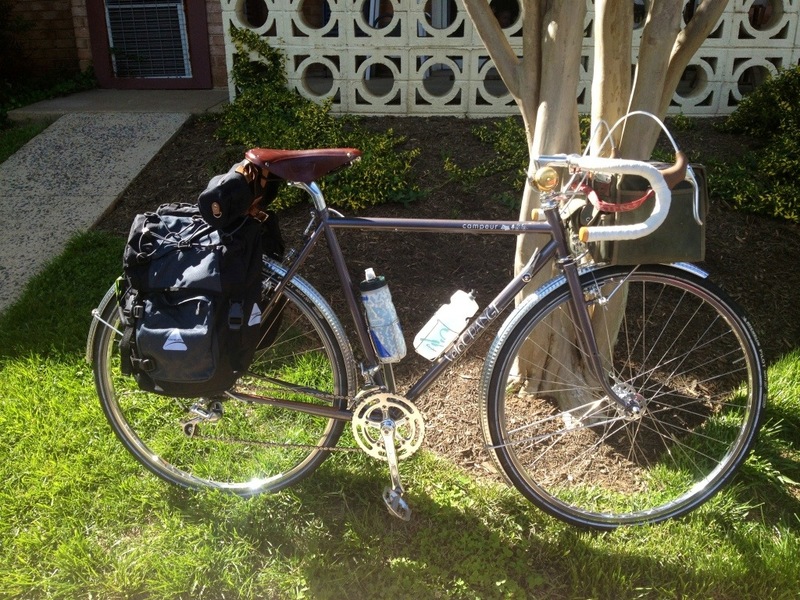 I plan on still doing a C&O ride later this month and wanted to feel close to what the bike would feel like on this trip. That meant both panniers fastened, front bag kept on and VO Baguette bag to the saddle loops. All of the bags loaded. I’d say the bike itself weighed around 35-40 lbs + my weight. I just filled the bags with as much weight as I thought I would bring with randomness. It wasn’t a long ride but I tried to vary it with different conditions but mainly gravel. I had a nice tailwind on the asphalt onset where I averaged a good coasting speed of 18-19mph. I have to say, the bike doesn’t just bump along with the added weight at this speed but it is a well-controlled, predictable and smooth ride. Continue to be surprised by this. From there, I jumped on the gravel where I negotiated sandy gravel and which ALMOST made me weary enough to slow down. Kept going and was controlled. This gravel almost resembles the towpath but slightly finer. On the gravel path a test of the uphills, downhills and turns was the goal. I did have an AHA moment where I took a low speed turn too sharply when hopping back on pavement. The gravel turned sandy and wheels went sideways and was barely able to unclip and put my foot to save a fall. Couple things from this-large gashes on the right pedal (doesn’t matter, not bike itself!) and learned the limits of gravelly sand and turns. I attribute this to the increased weight, have done the same turn w/o much weight and done fine. Back on the long uphill climb, same story as the first segment but slower. Cruising speed was about 14 which I took as good. With the new front sprocket I am able to keep up a higher cadence and keep it at speed for much longer. I was glad I did this run, although it is just a tiny bit of the whole picture. Onward ho!